What is the secret to dealing with temptations and worldly desires? Paul answers this simply: “Walk in the Spirit, and you will not fulfill the desires of the flesh” (Galatians 5:16). What Paul is saying is: a person cannot walk in the Spirit and fulfill the lusts of the flesh at the same time. We will do either one or the other. “Walking in the Spirit” means learning how to live out the life of God given to us when He gave us the Holy Spirit at our first moment of trust in Him. 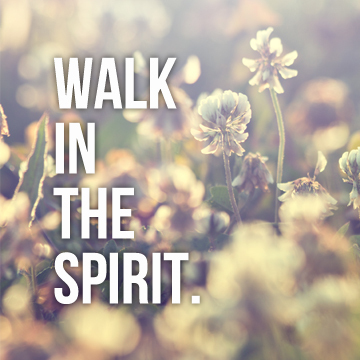 The only One who has fully walked in the Spirit is Jesus Christ. The rest of us are much more inconsistent. Even well-known evangelist Billy Graham at 95 says that he regularly confesses his sins before God. 1. Know who you are. Make Jesus Christ and His sacrifice on the cross the source of your identity. Know that God chose you before He created the universe, so reckon yourself dead to sin and alive to God now. Know that God is your Father, that He has always been on your side, that He wants you to succeed. Peter was a wavering coward, but Jesus still called him “the rock.” What possibilities does Jesus foresee in you? 2. Let your spirit dominate. The desires of the world demand attention, but they soon pass away. Learn to see the bluster of the world for what it is. Learn to see God’s control of all things and act accordingly. This may take many trials and errors, but every time you succeed, you build a foundation for future success. 3. Think “kingdom thoughts.” Know that God’s kingdom ultimately triumphs. Learn to develop thought patterns that reflect God’s ways, concerns and goals. 4. Pray and listen. Develop prayer as a dialogue with God. Learn to listen as well as to speak. 6. Examine yourself. Let the Bible help you do this. Be honest with God and yourself. Stop hiding and rationalizing. Let God show you the “junk” in your life He wants removed. 7. Know your weaknesses. We all have them, so know them. Give those weaknesses to the Holy Spirit and seek His help during temptation and pressure. Don’t let your weaknesses and failures discourage you. Confess your sins daily. Remember—God is on your side. 8. Know your Helper. The Holy Spirit is your best friend and mentor, so learn to know and trust Him fully. Take all your troubles to Him. As we look forward with Christ, others who hunger for righteousness will notice, and they will want to know the truth that sets them free. Some points taken from this article.